Blackford Flowers has a wide range of designs and styles of floral bouquets and arrangements available on our website, and we offer flowers for every occasion. We also offer a bespoke service if you cannot find what you are looking for on our website, or if you wish to create something more personal for your recipient. This service is great if you would like to specify your recipient’s favourite colour or flower so that we can make up an arrangement to suit them completely and that they will truly appreciate. Our Florists in Blackford have a passion for flowers and love to create new and exciting arrangements with an artistic flair that will give your flowers a real WOW factor. There are traditional and classic bouquets and arrangements or we can make something with a more modern twist if you prefer. 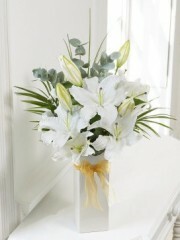 Flowers Blackford offer a delivery service from Monday to Saturday and you can send flowers anywhere within the UK. Our delivery service even extends to 140 countries abroad thanks to our trusted network of Interflora florists, so that you can reach your loved ones no matter where they are in the world. If you would like to send your flowers internationally or if you require any advice on doing so then feel free to contact one of our expert florists today and we will be happy to give you all the advice that you need. To make this service as convenient as possible you can specify a morning delivery before 1pm or an afternoon delivery which is after 1pm. Blackford Flowers are also delighted to offer Same Day Delivery for those occasions which pop up out of the blue or if you need flowers in a hurry. 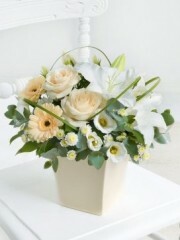 To benefit from this wonderful service we only ask that you place the order before 3pm so that our florists have ample time to give your flowers the care and attention that they deserve and also to allow our driver enough time to deliver them in a careful manner so that they look as beautiful as possible when they are received. With over 40 years of experience with flowers and delivery you can rely on Blackford Florists to provide everything you need and ensure that it looks as stunning as can be. Flowers Blackford has a vast array of bespoke gifts that can be sent by themselves or can make the perfect addition to your flowers to make your loved one feel extra special. We offer a selection of champagnes and wines which make a fantastic gift for your friends for those occasions that should be celebrated, such as a new job, new home, promotion, or anniversary. We have fruit baskets which are perfect for your loved ones who are not feeling their best that will be sure to brighten their day. Blackford Flowers also has chocolates, balloons and teddies which can be sent for birthdays, a new baby, thank you or just because. We will deliver everything together so that you don’t need to visit several different shops and can rest assured that every aspect of your order will be taken care of. We only use the very best flowers in all of our bouquets and arrangements and will not include any flowrs that are not fresh. To ensure that we have the highest quality of blooms we import all of our flowers directly from their site of cultivation in Holland so that they are as fresh as possible. By ensuring this long lasting freshness your recipient will be able to enjoy every essence of beauty from their flowers Balckford.